Average Weight	: 16 - 33 lbs. The Dachshund originated in Germany in the early 1600s. Bred to hunt small game such as badger and rabbit, the Dachshund has shortened legs to hunt and follow these animals to ground inside the burrows where they could fight the prey to the death. "Dachs" is the word for badger. Smaller Dachshunds where bred to hunt hare and stoat. Dachshunds have many "terrier" characteristics. They are versatile and courageous dogs and have been known to take on foxes and otters too. While classified in the hound group or scent hound group in the United States and Great Britain, there are some who consider this classification to be arguable, speculating that it arose from the fact that the word Hund is similar to the English word hound. Many dachshunds, especially the wire-haired subtype, may exhibit behavior and appearance that are similar to that of the terrier group of dogs. An argument can be made for the scent (or hound) group classification because the breed was developed to use scent to trail and hunt animals, and probably descended from scent hounds, such as bloodhounds, pointers, Basset Hounds, or even Bruno Jura Hounds; but with the persistent personality and love for digging that probably developed from the terrier, it can also be argued that they could belong in the terrier, or "earth dog", group. Part of the controversy is because the dachshund is the only certifiable breed of dog to hunt both above and below ground. Dachshunds often have been seen as a symbol of Germany. Because of this association, Dachshunds lost popularity in the United States during World War I and World War II. Their appeal was too great for this to resist, however, and they quickly made a comeback in popularity. Because of the association with Germany, a Dachshund named Waldi was chosen to be the first official mascot for the 1972 Summer Olympics. Dachshunds are a good choice for apartment dwellers and people who don't have a backyard. They are popular with urban dwellers because of their small size and ease of care. They generally are active indoors and also enjoy going on walks. Just be careful not to let them get too fat or allow them to injure their backs by jumping off furniture. Also, be sure to support their backs when you are holding them. Because of their long backs, they are susceptible to slipped or ruptured (herniated) disks in their backs, which can result in partial or full paralysis. Although they originally were bred to hunt ferocious badgers and other animals, today's Dachshunds are ideal family companions. Additionally, many people show them in conformation, obedience, agility, field trials, and earth dog trials. They are also hard-working and well-appreciated therapy dogs. Some people enter their Dachshunds in Dachshund races, such as the Wiener Nationals. Although these races are popular, the Dachshund Club of America opposes "wiener racing" because many Greyhound tracks use the events to draw large crowds and because the DCA worries that such races could injure Dachshunds' backs. •	All 3 varieties [Smooth, Long-Haired, Wire-Haired] and 2 sizes [Standard & Miniature] the Dachshund makes a great addition to any family ~ hence why today they are still one of our most popular, sought after breeds. •	The Smooth coated Dachshund is currently still the most popular, but the variety of sizes, colors and coat types: longhaired; wirehaired, etc., that offer minimum shedding and popular with allergy sufferers, makes this breed suited to almost every dog lover. •	Great apartment/condo dog ~ if neighbors can’t hear watchdog barking alarms. •	Dachshunds are good with children within their own family - if introduced early, but need to be supervised with other children. •	Dachshunds like to stay close to their owners, supervise and 'help' around the house - often getting underfoot to 'see what else’ the two of you can do together. •	The Dachshund "Standards" with the AKC state: "The Dachshund is clever, lively and courageous to the point of rashness, persevering in above and below ground work, with all the senses well developed." •	"Shyness" is not a Dachshund characteristic. •	Their body structure has led to many nick names including "wiener dog", "hot dog", "sausage dog", "Doxie", "Dashie", etc., and used to represent many brands of products and services. •	This breed has long been a favorite subject of cartoonists and toy makers, however, their 'cute appearance' was developed for practical and far more serious reasons. Their short legs enable them to dig and maneuver through tunnels to fight/corner badgers and other small animals. •	Dachshunds are an incredibly brave dog and are fearless in standing up against animals and others much larger animals than themselves. •	Even with their known intelligence & 'lively' spirit Dachshunds can still be stubborn and difficult to housebreak. ‘Crate-training’ may be a good way of working through this necessary need. •	Dachshunds are also known to have a mischievous side to them & can be tricksters to mask being obedient when asked - with a 'my way' attitude. Be patient, firm, and consistent when training them. •	Because they were bred for hunting and have found their way into the hearts and family pet arena today - they are more likely to start digging up your flower beds if a badger burrow isn't available. This tenacious character of theirs leads them to be relentless in pestering you for a treat. •	Remember: They were bred to not only hunt but kill their prey - so in your household, the "prey" will be a favorite toy that they feel must be destroyed. •	Dachshunds can be loud with some having deep barks for a dog their size - and they do like to bark! •	Dachshunds active nature means they need plenty of daily exercise to keep them from becoming fat and lazy, which will put more strain on their fragile backs. •	Be sure to monitor your Dachshund's food intake to keep their body fat 'trim'. •	This breed is prone to having slipped disks in their backs, which can lead to partial or full paralysis. Don't let them jump from high places, and when you hold them, support their backs, and don't let them 'jump' out of your arms - always 'place' them back on their floor. These tips will help minimize serious 'back problems' that commonly surface 'mid-life' in this breed. •	Dachshunds tend to bond closely to one person. This can lead to ‘jealousy’ for their owner’s attention and if not properly handled they can become ‘nippy’ towards others. Dachshunds require a large amount of interaction. If they become bored, they can be destructive, so it's important to keep them entertained when you can, and to keep them confined when you can't. Bored Dachshunds have also been known to become aggressive. Socialization is important as is obedience training, since some Dachshunds are very willful. Dachshunds can be quite demanding if spoiled. Once trained, they are very loyal and loving to their owners. They can be protective to a fault; they know no fear and will go into battle with any animal they perceive as a threat, regardless of its size. Dachshunds are extremely playful, and will love a good game of fetch, hide and seek or chase with their owners and with other pets in the home, so long as they are properly socialized with each other. They are prone to chasing small animals and birds when they are outside. For this reason, it's important not to let your dog off his leash in an uncontained area. He may become focused on chasing a bird and run away. This is not a good breed of puppy to bring into the home if you have small children. However, an adult Dachshund who acquires children will usually do quite well with them, as long as they are properly introduced. Particularly in the case of Miniature Dachshunds, however, children should always be taught how to handle them, since they are somewhat fragile, simply due to their size. Dachshunds are prone to spinal disc problems, also known as Dachshund paralysis. This is due to their very long spinal columns and very short rib cages. Dogs with this problem can become completely paralyzed. For this reason, it's important that your dog be trained early on not to jump, as jumping puts additional pressure on the spine. You should also be taught how to hold your dog properly, as improper handling can lead to back problems, too. Some veterinarians caution against Dachshunds using stairs, though most feel that it does not pose a problem for the dog to use stairs, as long as they are walking instead of running. Researchers are finding that the occurrence and severity of these spinal disc problems are hereditary in large part, so it's important to inquire about such problems from your breeder. They are also prone to Heart disease, urinary tract problems and diabetes. This dog can become inactive as they age, which makes them prone to obesity. This disease causes the same problems in dogs as in humans, shortening their life expectancy and making them more prone to heart disease, joint problems and diabetes. Being overweight also puts additional strain on their backs. Dappled Dachshunds are prone to Deafness and blindness. For this reason, they are very rare, as most breeders refuse to breed this pattern. These dogs do need exercise. As young dogs, they are typically quite active, but can get lazy as they get older. So, it's important that you provide them enough opportunities to exercise to keep them strong and prevent obesity. Since this dog is small, games of fetch in the house may be enough to get them proper exercise. However, they will also enjoy a walk with you and can get a good amount of exercise this way. Because of their short legs, they are not considered good running companions. 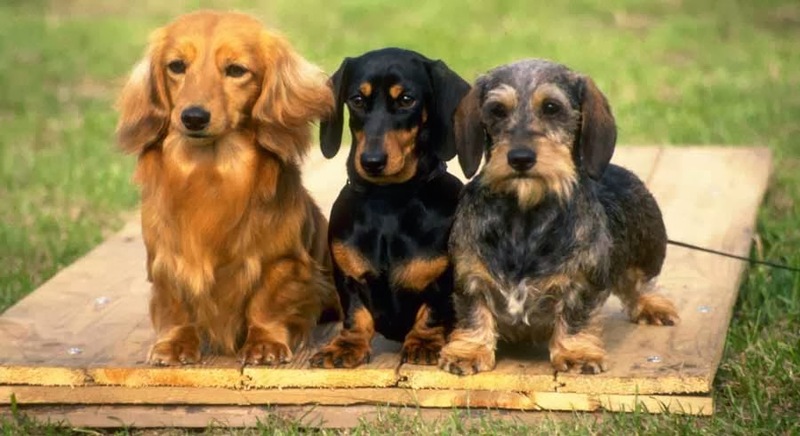 Dachshunds are very popular breeds for competition. In fact, the Weiner Nationals are extremely popular Dachshund races. In addition, many Dachshunds participate in earth dog trials, competitions for dogs to track and locate artificial bait or caged live mice. Because this breed is a scent hound, they also often compete in scent tracking events. The Dachshund Club of America holds a national scent tracking championship each year for the best trackers in this breed. The Dachshund requires firm and consistent training, but once trained, they are a great companion dog and extremely loyal. From an early age, they must understand that you are the "alpha dog", as they can be quite stubborn and resist training. Dachshunds require socialization at an early age, to prevent them from being wary of human strangers and fearful. They should also be taught early on about inappropriate barking and taught not to jump, since this can be dangerous for their spines. Crate training works well for housebreaking the Dachshund. Because this breed can be stubborn, and because their accidents are easy to miss due to their size, it's important to be very persistent in house breaking them. If they have an accident that goes unnoticed, they will believe that going to the bathroom in the house is acceptable, and the habit will be nearly impossible to break. Keeping your puppy in his crate unless you are actively interacting with him will help ensure that there are no accidents. Puppies should not be allowed to roam the house unsupervised until they are consistently house trained. It's wise to leave your Dachshund in his crate when you leave the house even after he's house trained, since they are prone to destruction when bored. After a period of time, you will know your dog well and will know whether or not it's safe to allow him to roam the house when you're away.